Choosing the perfect backpack requires a bit of contemplation and planning. The right choice can elevate your style while also making your life a lot easier. It can be a challenging decision, since there are so many colors and styles of custom backpacks to choose from. A backpack can even be considered a reflection of someone’s personality. However, finding the perfect backpack doesn’t have to be rocket science. iPromo can help you customize and design promotional backpacks, but the process starts with asking yourself a few important questions. Below, you will find 5 tips to help you find the perfect promotional backpack for your next promotional marketing campaign. Will your backpack be primarily used for school or the office? Or are you planning to primarily use promotional backpacks for those wanting to go on camping trips? Considering where your audience will be going with your backpack is an essential step for finding the perfect backpack. The Field & Co. Campster Wool 15” Computer Backpack is a great option, because it can be used for the office as well as camping. Its design is inspired by a retro camping aesthetic. This pack also provides a very functional layout. Tip number two is to consider how long you will be using the backpack. This will be very helpful for selecting the right sized pack for your needs. If are thinking of using the backpack to travel with for extended periods of time, you might want a bag that offers a lot of space and pockets. The Origaudio Mission Pack is an excellent choice for traveling, and can also be a great option for bringing to the office. This pack has an extra large interior capacity, multiple spots to hold bottles, and even a USB techport. How important is technology to you? Most people can’t leave the house without their smartphone or laptop. It’s always important to stay connected in today’s technology driven world. Think about what kind of technology your normally carry on a daily basis. This will help you get one step closer to finding the perfect backpack. Do you need a secure place to store your laptop computer? Will you need places in the backpack where cables can be conveniently fed through? 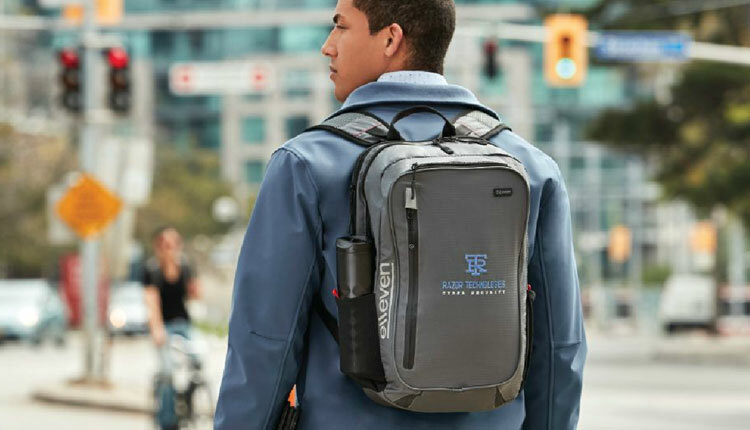 The Basecamp Commander Tech Backpack is a great option for those people in need of a backpack that intelligently integrates technology. This pack has pockets galore, along with a TSA compliant sleeve for keeping your laptop ready to pass through security at the airport. Sure, there are tons of practical elements to consider in order to find the perfect backpack, but another important tip for finding the perfect backpack is to think through your own personal style preferences. Custom backpacks you choose are a direct reflection of your style. Do you want something that’s edgy and intriguing? Perhaps you prefer something a little more on the simple and conservative side? The High Sierra Elite Fly-By Compu-Backpack is an option that provides a lot of style, with it’s sleek and eye-catching look. This pack also provides a lot of functionality, as it can store laptops and tablets with ease. Traveling can be a complicated process, especially if you are doing it frequently. Having a backpack that makes your life easier when you travel is a huge plus. There are a variety of promotional backpacks that have TSA compliant designs which can make traveling a much easier process. The Elleven Square TSA 15” Computer Backpack is the perfect example of a bag with a flawless design. This bag was devised with frequent travelers in mind and holds up to a 15.6” sized laptop as well as an iPad or Tablet. It’s very easy to pack an unpack this backpack, thanks to a 270-degree organizer opening and a luggage-style main compartment opening.